BlackBerry rolling out Android 6.0 Marshmallow update for PRIV. BlackBerry has today announced that Android 6.0 Marshmallow (M) is now available on ShopBlackBerry.com and is coming to all major carriers offering PRIV starting May 3. You'll be able to update to the latest version of Android, completely patched to include its coming May 2016 update, simply by downloading the software update on your PRIV (be sure to connect to Wi-Fi to avoid unnecessary data charges). PRIV is among an elite group of smartphones running Marshmallow, which was released in October 2015. As of April 4, only 4.6% of Android smartphones were running it, though adoption is slowly climbing. PRIV's place as an early Marshmallow adopter, less than a month after BlackBerry started beta testing it, makes perfect sense - BlackBerry have been aggressive in rolling out Android security updates faster than most Android device manufacturers. 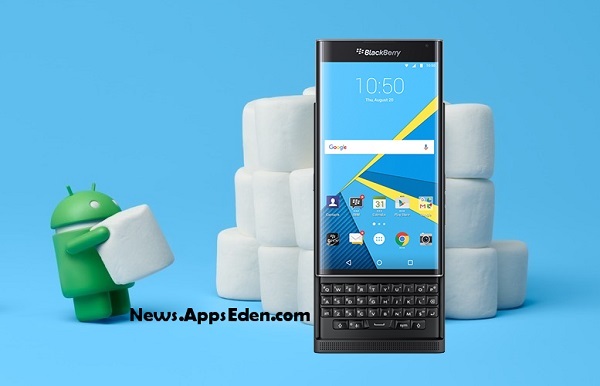 Take a look at the features BlackBerry have added to security, BlackBerry keyboard, BlackBerry Hub, BlackBerry Launcher, battery performance and camera features in PRIV's flavor of Marshmallow. Customized Personal Data Permissions - Apps demand access to personal data, even when it's not necessary for the app to function properly, but DTEK now gives you the power to control what to share and when. You can turn permissions off at any time and still continue to use the app. Clearer Notification Settings - You'll only see notification controls for sensors that an app has specifically requested access to. For example, if an application doesn't request microphone access, it will not appear in the list. S/MIME Support - The new S/MIME feature in BlackBerry Hub lets you digitally sign and encrypt your emails, adding another level of security to your communications. PRIV's BlackBerry Keyboard has been updated to provide better predictive typing, accuracy and control with these new features. More Emoji - You'll have access to over 200 new and updated emojis. New Keyboard Gestures - The new swipe capability allows you to drag your finger across the keys to enter words on the virtual and/or physical keyboard. Enhanced Word Prediction - The keyboard anticipates your next word based on where you place your fingers on keys. Also, predictive typing learns words with numbers and delivers better name suggestions based on your contacts. Better Cursor Control - Activate "Cursor Control" mode on the physical keyboard for easier positioning and control. You can accurately place the cursor on the screen by tapping a key on the physical keyboard. Mute Indicator - See the phone's mute status at a glance via the floating phone indicator that appears when a call is active. You'll see yellow when your call is muted and green when it isn't. New Apps in BlackBerry Hub (right) - Now view notifications from even more of your favorite social media apps - including Instagram, Skype, Slack and Pinterest - directly in BlackBerry Hub to easily manage all your messages in one place. Updated BlackBerry Launcher - Better organize apps and widgets into Recent, Personal and Work sections, and you can set a default home screen, delete a home screen and remove apps with a flick. Doze - When PRIV is at rest, Doze automatically puts your device into a sleep state to increase standby battery life. App Standby - This new feature keeps infrequently used apps from impacting your battery life. Media Card Encryption Support - You can safely and permanently increase your PRIV's storage capacity by encrypting your media cards. If your PRIV is lost or stolen, prying eyes can't take the media card out of your PRIV and view or copy it. This is a feature that many other Android phone makers do not support. Capture Professional and Cinematic Quality Videos - Record videos at 24fps - the standard frame rate used in professional feature-length motion pictures - in 4k, 1080p or 720p for high-quality footage to share on social media.